On a whim, Matteo and I decided to visit the SLO Children's Museum after dropping Serafina off at Cinderella. The two of us get quite a charge out of the place. Among today's favorites, pictured below, where the Topo Table and Shake It Up. 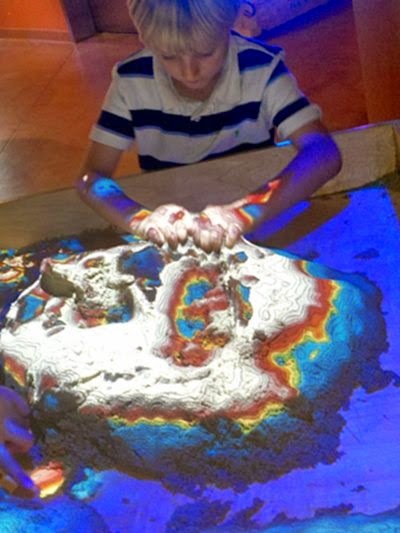 The Topo Table had all-white sand that kids could mold and shove around to their hearts content. In the meantime, a camera and projection system was mapping the topography of the sand and projecting topo lines and depth colors from above onto the otherwise white sand. Very cool! The deep blue areas were the lowest elevations all the way up to white being the highest elevations. 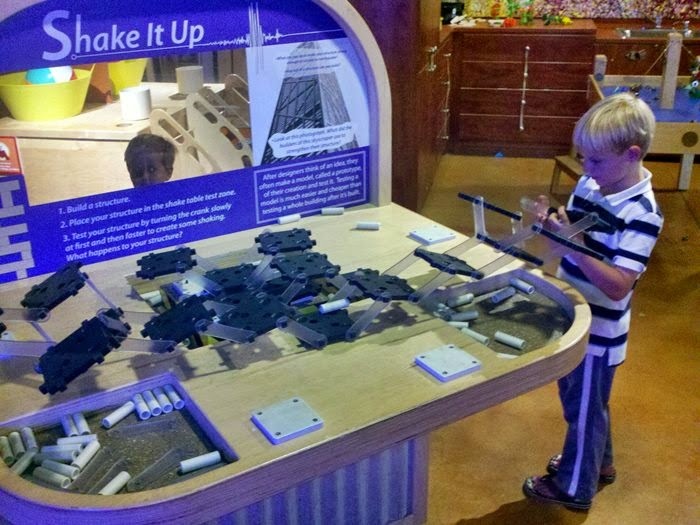 The Shake It Up station let you build structures and then shake them to see how they'd behave in an earthquake. Afterward, Matteo asked if we could eat at a restaurant on the way home. I said sure, where do you think? To which he started to rattle off an entire list, "Well there's Habit, Pizza Solo, Woodstock, Splash, blah, blah, blah." He is paying attention.